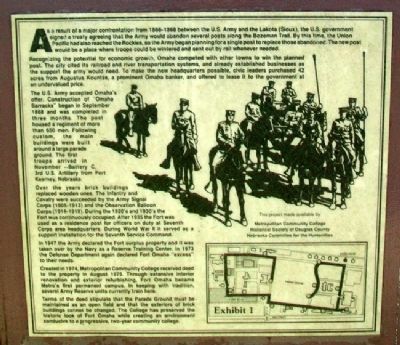 As a result of a major confrontation from 1866-1868 between the U.S. Army and the Lakota (Sioux), the U.S. government signed a treaty agreeing that the Army would abandon several posts along the Bozeman Trail. By this time, the Union Pacific had also reached the Rockies, so the Army began planning for a single post to replace those abandoned. The new post would be a place where troops could be wintered and sent out by rail whenever needed. Recognizing the potential for economic growth, Omaha competed with other towns to win the planned post. The city cited its railroad and river transportation systems, and already established businesses as the support the army would need. To make the new headquarters possible, civic leaders purchased 42 acres from Augustus Kountze, a prominent Omaha banker, and offered to lease it to the government at an undervalued price. first troops arrived in November – Battery C, 3rd U.S. Artillery from Fort Kearney, Nebraska. Over the years brick buildings replaced wooden ones. The Infantry and Cavalry were succeeded by the Army Signal Corps (1905-1913) and the Observation Balloon Corps (1916-1919). During the 1920’s and 1930’s the Fort was continuously occupied. After 1935 the Fort was used as a residence post for officers on duty at Seventh Corps area headquarters. During World War II it served as a support installation for the Seventh Service Command. In 1947 the Army declared the Fort surplus property and it was taken over by the Navy as a Reserve Training Center. In 1973 the Defense Department again declared Fort Omaha “excess” to their needs. Created in 1974, Metropolitan Community College received deed to the property in August 1975. Through extensive interior renovation and exterior refurbishing, Fort Omaha became Metro’s first permanent campus. In keeping with tradition, several Army Reserve units currently train here. Terms of the deed stipulate that the Parade Ground must be maintained as an open field and that the exteriors of brick buildings cannot be changed. The College has preserved the historic look of Fort Omaha while creating an environment conducive to a progressive, two-year community college. Location. 41° 18.52′ N, 95° 57.473′ W. Marker is in Omaha, Nebraska, in Douglas County. Marker is on Middle Street, on the left when traveling west. Touch for map. 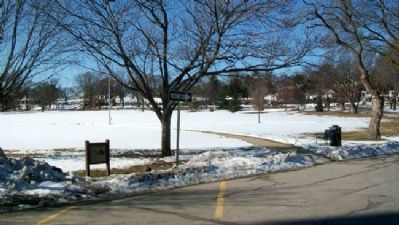 Marker is in near the northeast corner of the former Parade Ground, south opposite the main parking lot, on the Metropolitan Community College Campus. Marker is in this post office area: Omaha NE 68111, United States of America. Touch for directions. Other nearby markers. At least 8 other markers are within walking distance of this marker. Fort Omaha Guardhouse (within shouting distance of this marker); General Crook's Headquarters at Fort Omaha (about 300 feet away, measured in a direct line); Quartermaster's Office and Commissary (about 300 feet away); Fort Omaha Post Exchange and Gymnasium (about 500 feet away); Observation Balloon Training at Fort Omaha (about 500 feet away); Fort Omaha Balloon School (about 500 feet away); Fort Omaha Knights of Columbus Assembly Hall (about 600 feet away); Fort Omaha Fire Station (about 600 feet away). Touch for a list and map of all markers in Omaha. More. Search the internet for History of Fort Omaha. Credits. This page was last revised on June 16, 2016. This page originally submitted on August 7, 2012, by William Fischer, Jr. of Scranton, Pennsylvania. This page has been viewed 431 times since then and 6 times this year. Photos: 1, 2. submitted on August 7, 2012, by William Fischer, Jr. of Scranton, Pennsylvania.